A little detail often forgotten.. or a MAJOR factor? Ladies, you may be wondering what “little” wedding detail today’s post is going to be about. Guess what, it is little. It is something that is often forgotten to be exact. What is it? The “reserved” sign. Okay, so I made this big lead up and came to you with a “reserved” sign. You might be wondering, where is she going with this. Why such drama around a reserved sign? Let me tell you a little story of a wedding we worked. There were eighty invited guests including the bridal party. Seems very straightforward and simple right? Wrong. The original guest list was one hundred fifty and due to unforeseen circumstances, the guest list had to be cut. This was no easy fete. With large families on both sides, it was very hard to come to eighty guests. After much work and evaluation, eighty guests were selected and notified that they were the chosen lucky ones. Hooray, all is well in the world. But, disaster was on the horizon. Come wedding day, one hundred guests were invited to the ceremony, of which one hundred and fifteen showed up. Now, you may think I am exaggerating – as this would be a planner’s nightmare, after all. But, I kid you not. There were one hundred fifteen guests. Yes, you might have guessed, some of said one hundred invitees, brought a plus one (which was not allowed per the invitation, but that is for another time – stay tuned for “Invitation drama”). *Hasta Luego, See ya, Bye-Bye*. Sad, but true. We made it through the list with a few special guests that the bride or groom really wanted to stay. But Y'all. And here is my full circle. The tables were not numbered. And there were NO reserved signs. CHAOS everywhere. Where will the family sit? Who is to be near to the bridal party? Where will the persons who are about going to sit? Several guests had decided to seat themselves as we were sorting out the checklists and had to be asked to move to accommodate the family, and were later seated after the bridal party and the important persons that were giving the toasts were seated. Okay, so that was the story, but, Y'all. Long story short. A lot of that drama and headache could have been avoided with a few table numbers and some reserved cards. Early during the planning process, this was all there. 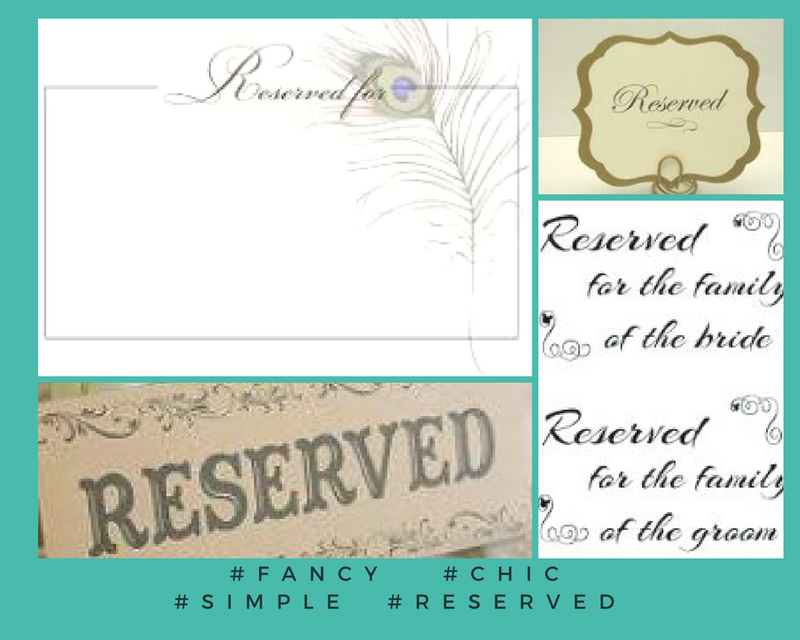 A seating chart, table numbers, and a designated family table. Planning can be so hectic that this can sometimes get lost, and it seems like no small matter. The sad truth is that it can be a big issue. As of that day, reserved signs are one of the first things that go in my emergency kit. We now know how to prevent chaos from happening by reserving the family’s seats and asking the maid of honor of all the important persons that should be seated close to the family. They are all now seated before the remaining guests, who can then choose their own seating. Reserved signs Y'all. A small but mighty planning tool that can help the wedding reception be absolutely amazing or utterly chaotic. A lesson well learned, and now we are always prepared, and you should be too. Don’t push the seating chart to the last week of the wedding, if you feel that you are running out of time, have a designated friend that is good at organizing to help you. But if you absolutely ran out of time…With us? No seating chart? NO problem.